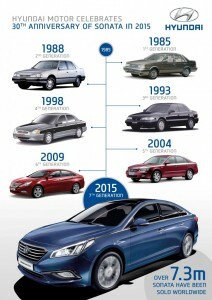 The 2015 is a very special year for the Hyundai Sonata, as it celebrates its 30th birthday. 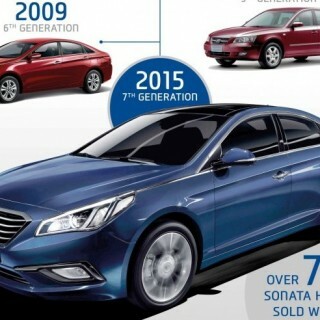 The Sonata has been a massive sales success for the Koreans during that time, selling 7.3 million units globally. The current model is actually the 7th generation of the Sonata, and Hyundai will be delivering an all-new 2016 Sonata plug-in hybrid model to mark the momentous occasion. 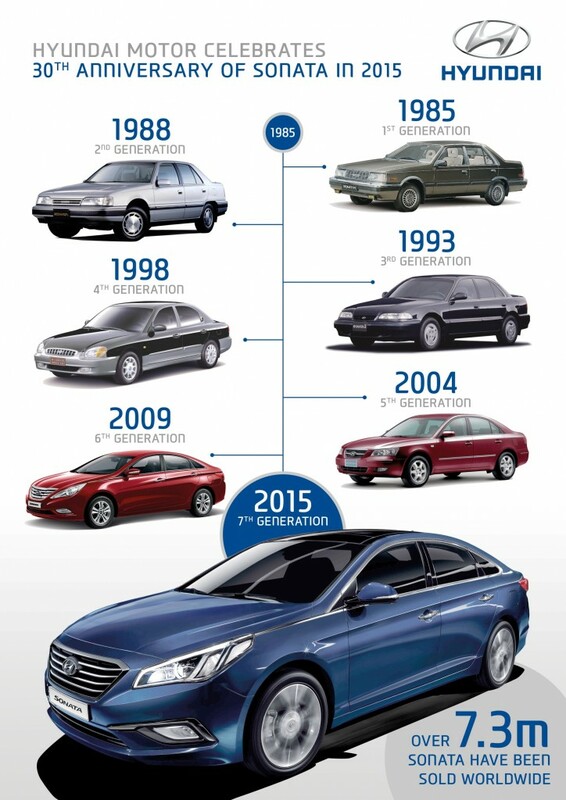 Let’s take a quick look at the evolution of the Sonata sedan over its 7 generations. This was a big step for Hyundai, as it was one of the first models that was fully developed by the in-house design team. It proved to be a major success for Hyundai, as it went on to exceed 1 million unit sales in Korea. Did you know that the first generation of the Sonata sedan was built on the RWD platform? Sound cool, right! The 1st generation model was a rear-wheel drive, but the 2nd generation Sonata made the switch to a rear-wheel system. There was also changes made to the exterior design, as it moved away from the angular design of vehicles in Korea to adopt a more aerodynamic look. When this model received a refresh in 1991, it became the first model to show off the newly revised Hyundai logo. The digital age came into being during this generation, bringing new vehicles into the modern world. Hyundai fully embraced this change, delivering a number of advanced features (ABS brakes, automatic side mirrors, etc.) that really appealed to consumers. This model was another huge seller, and was actually tops in Korea for a period that stretched to about 18 months. The 4th generation model was made available to European consumers and came equipped with a Hyundai Intelligent Vehicle Electronic Control transmission. By the time 2004 rolled around, the Sonata was tops in the midsize sedan segment in the J.D. Power Initial Quality Survey in the US. This was where things really began to change for the Sonata in a design sense, as the 5th generation was definitely European inspired. As well as offering more premium styling than ever before, the Sonata also came fully equipped with safety features that helped it achieve a top-ranked safety rating. This was when consumers and the automotive media really started to sit up and take notice. More styling changes were introduced with the 6th generation model, most notably the new Fluidic Sculpture design philosophy that Hyundai was adopting across its entire line-up. The addition of a more powerful and efficient engine lineup helped the Sonata achieve global acclaim and sales success in the midsize sedan category. 2014 saw the Sonata Hybrid model introduced to the world. 30 years in the making, the all-new Sonata continues to take the vehicle to all new levels of refinement and performance. This has been achieved by evolving the Fluidic Sculpture design philosophy even further, whilst also expanding the powertrains on offer, which includes a pair of eco-friendly models. One of those, the Sonata Hybrid was unveiled last year, while the Plug-In Hybrid model was unveiled at the North American International Motor Show earlier this year.